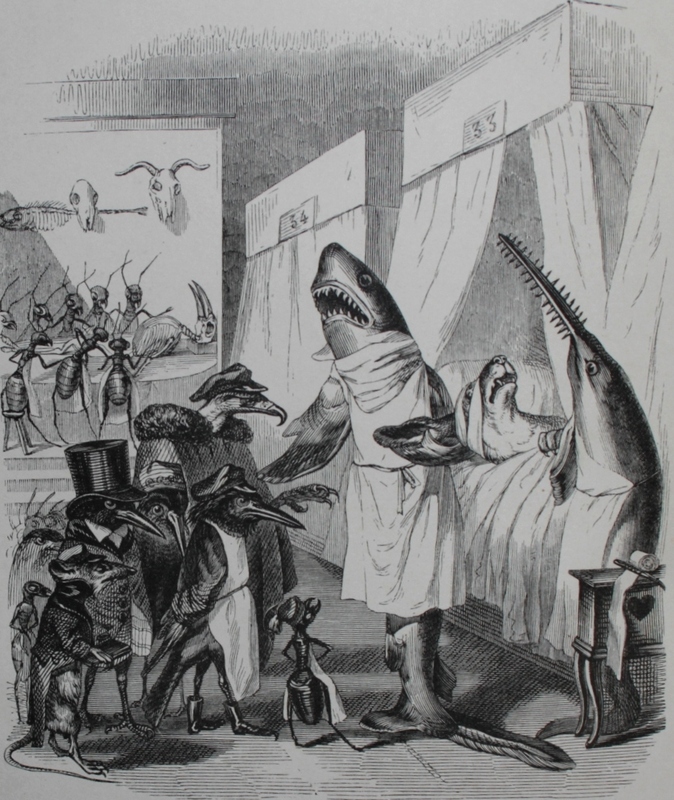 I often illustrated Stan’s columns with sketches by Grandville such as this one, from “Les Animaux” (1842), which mocks the sort of doctoring Stan often wrote about and fought to remedy during his long life in medicine. Rhode Island has lost one of its longtime leading lights. Stanley M. Aronson, M.D., a giant of medicine in the Ocean State, a founder of the Brown University medical school, and a contributor of commentaries to the Providence Journal’s oped page as long as I can remember, died today at age 93. Other than to shake his hand at various social events, I did not know Stan, but I feel intimately acquainted with him since I spent almost a quarter of a century proofreading his Monday column. For decades at the Journal I was responsible for designing the Monday oped page on which Stan’s column ran. So I became familiar with his cadences, his tendency to draw out his sentences, always with an eye toward structuring them so that readers could easily follow their curlicues. He always found le mot just, often one of the multisyllabic variety, but always deployed so that the reader, applying context, could deduce its meaning if not already known. Stan’s copy rarely needed editing for style or punctuation. Unlike many other writers, we always gave him the space he needed. He was invariably correct as to grammar, and yet sometimes he’d inject a punchiness of phraseology that broke up the winding quality of his prose style. His sense of humor was so dry as to be virtually indetectible, like the greatness of a very fine bottle of wine. I also enjoyed finding art for Stan’s essays, which always tested my knowledge of our extensive copyright-free library. Frequently it was the works of Doré or Grandville that seemed most appropriate to illustrate Stan, since their drawings, from the 19th century, were elegant and erudite – with a range that made it relatively easy to find a sketch to serve as a metaphor for Stan’s subject of the week. I would guess that I went through this process with Stan’s column at least a thousand times. I knew very little of Stan’s medical accomplishments, except that they were beyond exemplary. Rhode Island readers will miss Stan’s writing, but we all have, as well, a reason to be glad of his influence on the quality of medical care in Rhode Island today. A good man, he will be greatly missed. This entry was posted in Books and Culture, Providence, Rhode Island and tagged Brown Medical School, Dore, Editing, Grandville, Journalism, Medicine, Stanley M. Aronson, Writing. Bookmark the permalink.